Okay, I’ve had some weird things in restaurants, but this one takes the cake. I suppose it’s fitting, since it is fair season. That there is a fried rib. 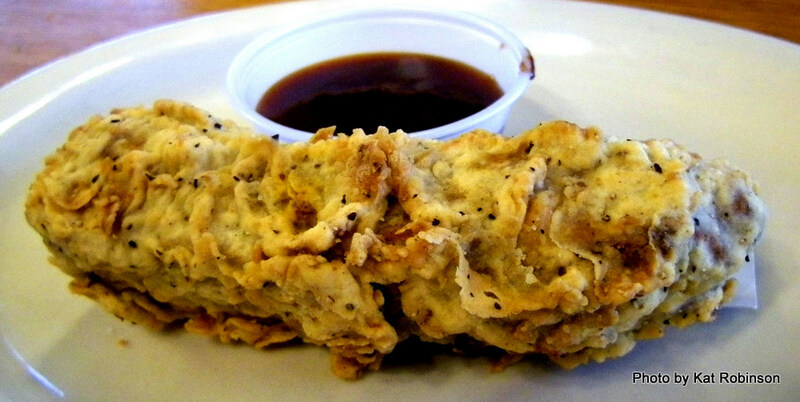 You heard me right, fried rib. 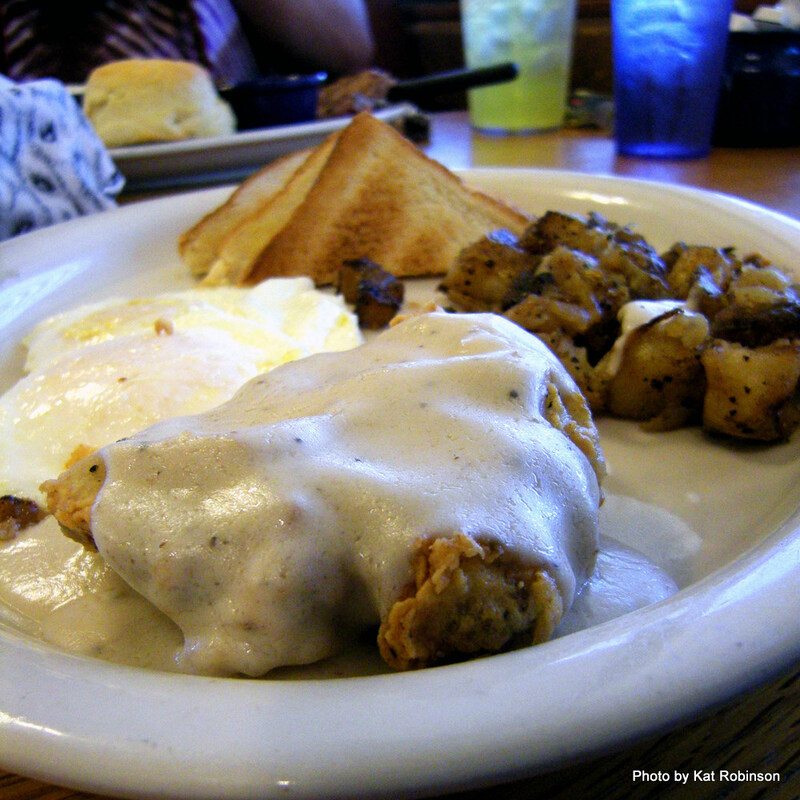 It’s not part of the usual breakfast fare at Fort Smith’s Calico County, but the big signs outside and inside the restaurants promoting the dish got us curious. Grav and I had to check them out. Of course, we got breakfast, too. Calico County was the 12th breakfast I managed in just over three days on a sweep of western and northwestern Arkansas morning eateries. It was also the last, for good reason. This particular Labor Day morning I was about breakfasted out, and I needed something that was really going to spark my interest and satisfy my breakfast wants. 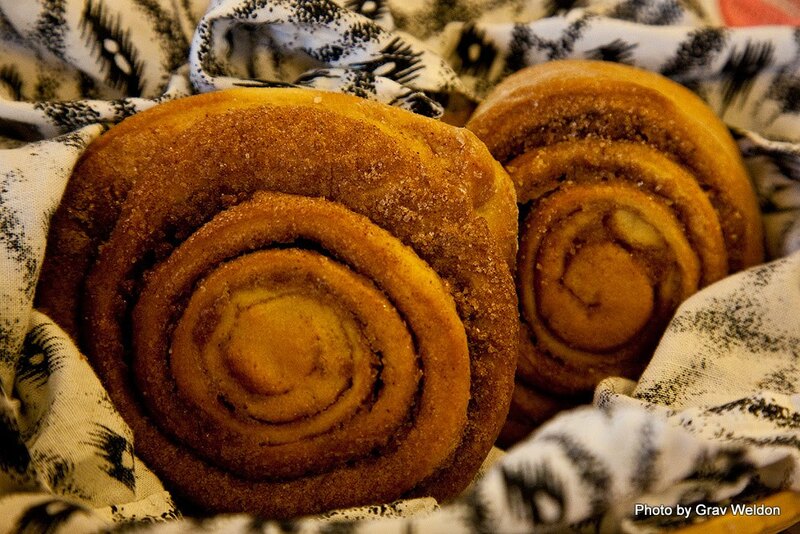 Of course, you don’t go to Calico County without trying the cinnamon rolls. They just come out with every meal, a fact of life that’s been a standard for the restaurant’s twenty-someodd years. Over that time the place has served up over six million of the coffee-perfect rolls. Unlike the average cinnamon roll, these aren’t caked or iced with way too much sugar. They’re tight little traditional homestyle rolls full of cinnamon tightly rolled and sliced and baked. And when you sit down the waitress brings you out a towel-lined basket with a couple. 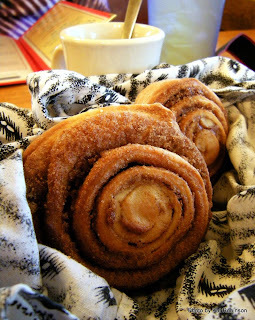 To me, on a normal day, that single warm-from-the-oven cinnamon roll and a cuppa joe would be enough for breakfast. But when your belly’s been stretched out from eating eleven other breakfasts in the past three days… a simple cinnamon roll’s not going to do it. So into the menu I went. And I have to say, I was really tempted by the Fruit-Topped Waffle ($4.25), a Belgian waffle topped with blueberries, peaches and bananas, but because I knew I’d be telling you about it I knew I needed to have one of the famed country breakfasts. The breakfasts, by the way, are pretty much what you choose. You can have the Bargain Basement Special ($4.65) and get an egg dish and a bread and a starch, or go a bit more for the Traditional ($5.65) and get a meat, an egg dish and a bread. But I wanted grits. So I had two choices, and since I wasn’t quite hungry enough for the Giant Country Breakfast ($7.20) I went for A Hearty Favorite ($6.35). So did Grav. But what we got was so different… well, here you go. I chose a Scrambled Country Omelet -- usually a two-egg dish with potatoes, onions, ham and green peppers but which they omitted the peppers for me. 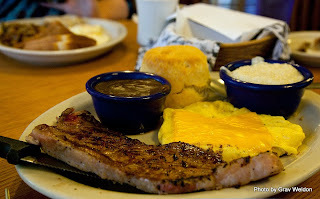 I also went with a New York Strip Steak, some biscuits with chocolate gravy and of course grits. 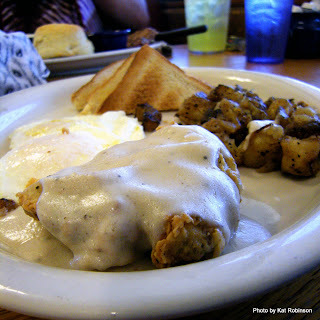 Grav chose a couple of eggs over easy, the country fried steak, toast and spicy potatoes. But he also asked our waitress if he could try one of those fried ribs. She said she’d check for us. I just grinned and took another photo. 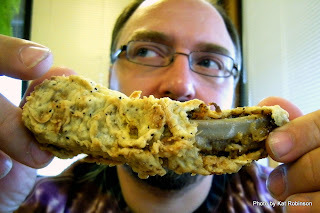 This was one of those times I was ambivalent about my pork allergy. I mean, I would have liked to have tried the thing, but on the other hand all that cholesterol was just kinda hollering out this rebel yell of badness. I can’t imagine what a platter of these things would be like -- and our waitress told us the fried rib meal comes five or six bones to the plate. She brought us out our breakfasts moments later, and two very different breakfasts they were. Grav’s country fried steak was smaller than I had expected, and he told me the dinner size portion was about three times that size. 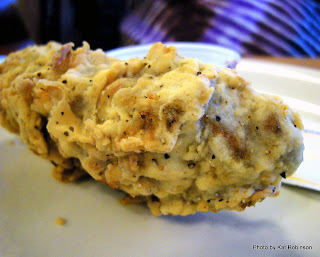 But it was thick and covered in cream gravy and an excellent breading that held on well to the steak. He let me try a bit, and I tell you, if it’s not the best country fried steak I’ve had in Arkansas, it’s awful close. His eggs? Sufficiently runny. His toast? Sufficiently toasty. His potatoes? I tried them… and was impressed. The pan-fried Spicy Potatoes are very soft, well cooked potatoes sautéed up with black pepper, green bell pepper and onion with a little Jalapeno. Hearty enough to enjoy on their own. For mine? I had that steak, and I’d ordered it medium rare, and for a breakfast steak (which tends to be thinner than a dinner steak) I was pleased at the robust pinkness. The scramble was decent, with a coating of American cheese on top. The grits? Aw yeah. I was craving grits and I got what I deserved, nice soft barely grainy grits with plenty of butter in them already. I ate every bit of those grits. And then there was the biscuit. 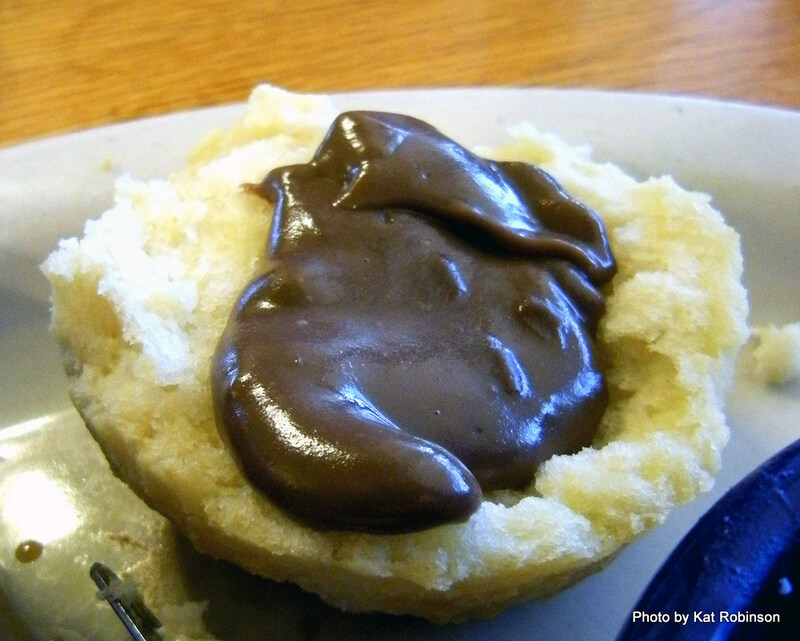 I’d ordered my platter with biscuit and chocolate gravy -- not because I’m a fan of chocolate gravy but because I was curious about it and because I wanted a biscuit. The biscuit itself was about three and half inches tall and golden and sitting on the edge of my plate like a crown. I picked it up and pulled it apart, and the scent of sweetness came to me. These are just slightly sweet quite buttery biscuits that are flaky and moist within and they are perfect. I peeled a bit of the inside and ate it, and looked at the chocolate gravy with a sigh. 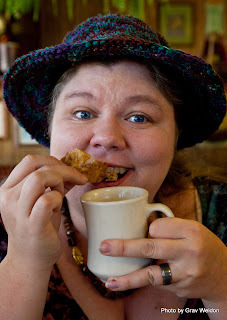 Because of you, dear reader, I am willing to sacrifice a little biscuit for some gravy topping it really doesn’t need. See, though many people claim chocolate gravy is an Arkansas thing I didn’t come into contact with it until I was an adult, and it always seems weird. Worse still, so many of the places I have gone have substituted a heated chocolate pudding for the gravy that I have become disenchanted. But Calico County has such a sterling reputation for good Southern food that I figured what the hell. And… this was indeed chocolate gravy. I could taste the butter and the flour that had been rouxed together, the cocoa powder and the added milk and sugar. It tasted all right and it felt authentic. I… I’m just not a big fan of chocolate gravy, that’s all. 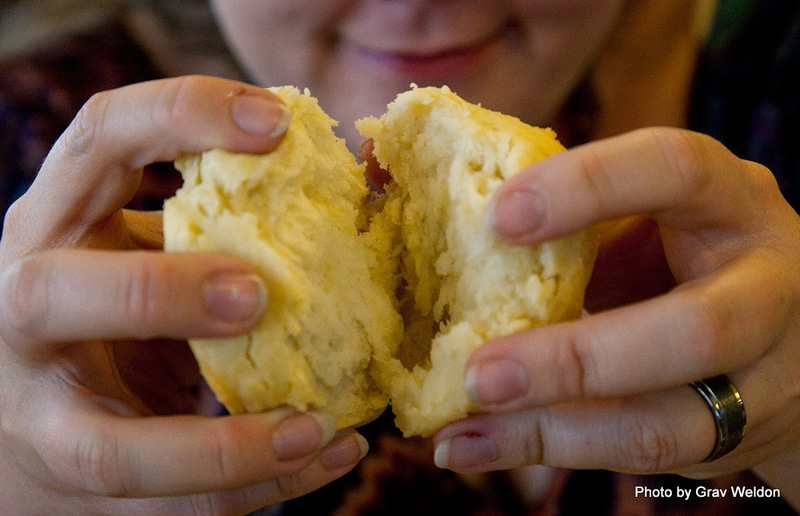 But I did go after that biscuit with some real butter. In fact, Grav was poking fun at me because I opened packet after packet and smeared it on, ate a layer and repeated. I really wanted that butter and that biscuit was the perfect vehicle. 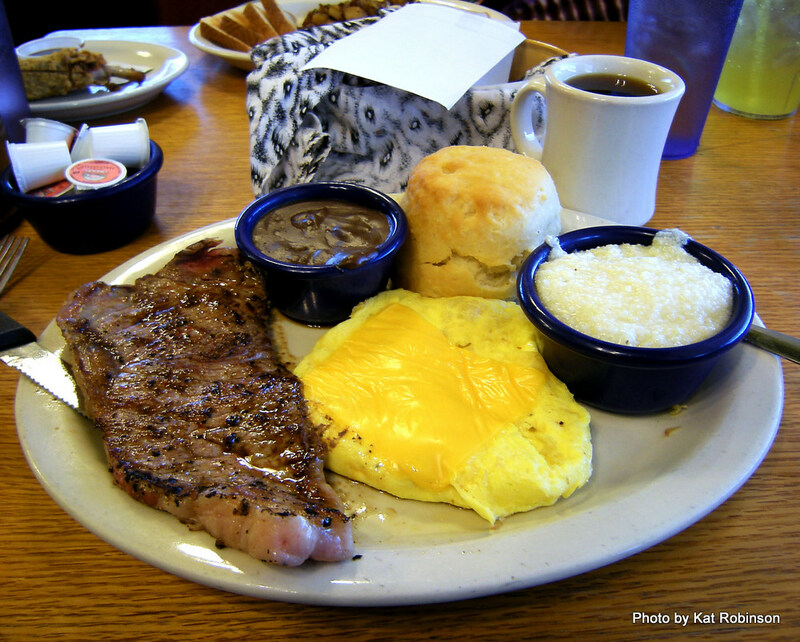 I think I would have really been happy that morning with just a bowl of grits and a couple of biscuits. It was good food, and it was a lot of food. And it was just what I needed. But when I got up after eating most of that platter and drinking a couple of cups of coffee I found I didn’t want to move. By the register, there’s a rack of day old rolls and cinnamon rolls. 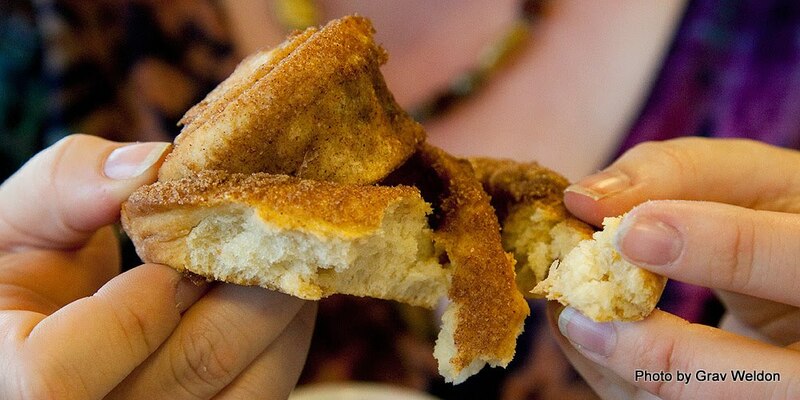 A dozen cinnamon rolls are $2.75, and they come with directions on how to warm them up at home. And they’re worth it. You can even freeze them, which is great if you don’t live close (like me) but rarely practical, since a box of a dozen won’t last a full day at my house. I’m not sure when Calico County opened, but it has been around since at least the mid-80s and many say it is THE place to have breakfast in Fort Smith. That’s saying something, since Fort Smith is blessed with a higher percentage of locally owned mom and pop style breakfast joints and 24 hour diners than anywhere else I’ve found in Arkansas. I’m glad I dropped in. And I’m really glad I didn’t attempt it on the same day as I tried all those other breakfasts… that story’s still to come. You’ll find Calico County off Rogers Avenue west of I-540. Don’t fret, there’s a big billboard-type sign with an arrow to get you there. They have a great website or you can call (479) 452-3299. Now I've got to go back to Ft. Smith! 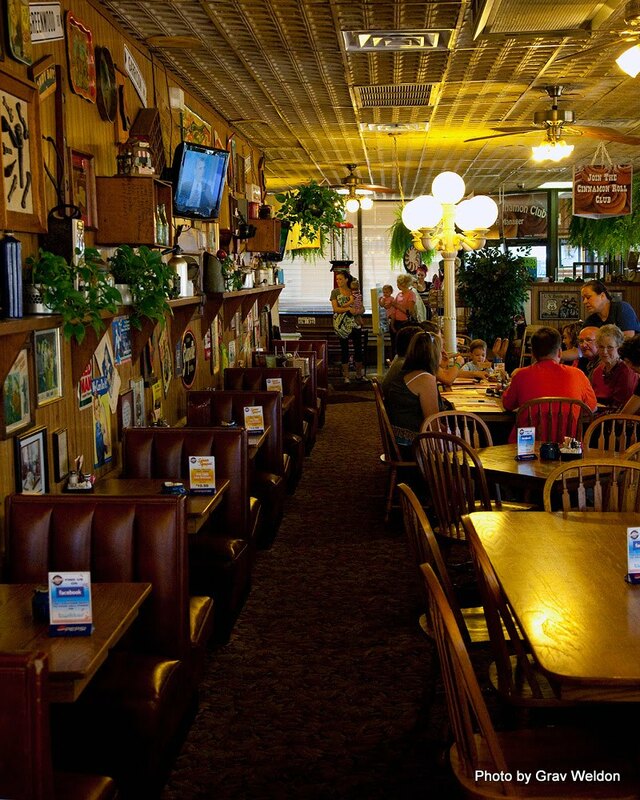 I ate at Lewis Family Restaurant when I was there on business last week, based on your review, and had the best chicken fried steak I've ever had. Keep up the good work! 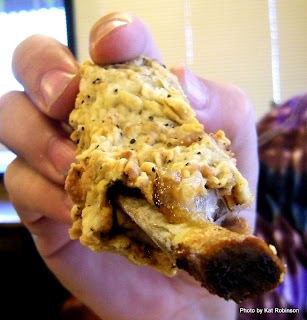 Deep-fried ribs? What's next... deep-fried Caesar salad? I used to travel to Memphis a lot and I thought the "wet" and "dry" ribs covered all the bases in terms of rib preparation. I see I was wrong. Thanks for sharing some tasty meals.